Arrival in Chiang Rai in the morning for your the start of your Chiang Rai Chiang Mai Loy Krathong Tour. Your guide and driver will meet you at the airport. Start touring. Drive to the Golden Triangle where the borders of Laos, Thailand and Myanmar meet. Make a relaxing boat trip to Don Sao, a small island that belongs to Laos. We will stop here briefly and walk around the souvenir market. Have lunch at a riverside restaurant. Visit a small Opium museum that tells the history of the use of opium, poppy cultivation and the opium trade in the Golden Triangle. Please note that this is not the Hall of Opium. Drive to nearby Chiang Saen, which was once a centre of power of the Lanna kingdom. Visit the ruined temples Wat Pasak and Wat Chedi Luang. Drive to Chiang Rai. Along the way visit a settlement of the Long Neck Padaung, Big Earring Kayah and Akha people. This is not a real village. It has been established for tourists but it is worth a visit. Drive Back to Chiang Rai. Check into the hotel. Evening free at leisure. Your guide and driver will meet you at the hotel at 0830. It is the third day of your Chiang Rai Chiang Mai Loy Krathong tour. Drive to Ban Dam aka the “Black House”. It is the proud work of Tawan Duchanee, a Thai artist who has developed a style of work representing the darkness in humanity. With lots of red and black hues, skins, skulls and various other animal parts made into eerie artwork. Drive back to Chiang Rai where we will visit Wat Rong Seua Ten aka the Blue Temple. Lunch will be at a local restaurant. After lunch we will drive to Elephant Valley, a unique very elephant friendly project, located just south of Chiang Rai. 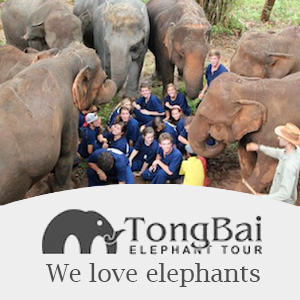 Learn about the elephants and observe them in natural habitat. After Elephant Valley visit Wat Rong Khun, the famous “White Temple”. It was designed by Thai artists Chalermchai Kositpipat in 1997. We spent some time admiring this beautiful temple. On the way back to Chiang Rai you will visit the Singha Park, an agro-tourism destination focusing on the development of sustainable tourism. Return to the hotel. Overnight at the Laluna Hotel and Resort or similar. Your guide and driver will meet you at the hotel at 0830. Drive to Chiang Mai. Stop at Charin Garden Resort, famous for their cake (optional and not included). Visit Wat Sangkaew, a spectacular temple devoted to Kruba Srivichai, the “engineer monk”. Kruba Srivichai’s followers constructed the road leading up to Wat Doi Suthep, the temple you will visit tomorrow. Drive to Chiang Mai to check into your hotel. The rest of the day will be free at leisure. Return to the hotel to fresh up for the Loy Krathong festivities. We will head for the Ping River. 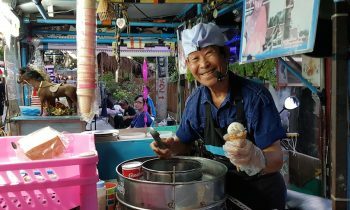 Tonight you will have the opportunity to the Loy Krathong festivities. You will also release two sky lanterns near the Ping River. An unforgettable experience! We will transfer you back to the hotel at 2200 or you can return to the hotel on your own. Your guide and driver will meet you at the hotel at 0830. Drive to Doi Suthep/Doi Pui national park. Visit Wat Prathat Doi Suthep, the most famous temple of Chiang Mai. Walk up the 300 steps to the temple. Views from the temple over Chiang Mai are spectacular. Your guide will explain about the history of this temple. Enjoy lunch in one or our favourite restaurants. Transfer to a our office or a local house. Here you will make your own krathong by hand. Here you will make your own krathong by hand. The krathongs used for floating at the festival are made from a slice of a banana tree trunk or bread. A krathong is decorated with elaborately-folded banana leaves, incense sticks, and a candle. We are sure you will make the most beautiful one yourself! Return to the hotel and relax. Your guide and driver will meet you at the hotel. 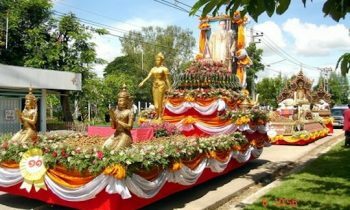 This evening there will be another parade again at Thapae road. It is the parade of the big krathongs. This is the third and last day of Loy Krathong. At Wat Chaimongkon we will float our self-made krathongs on the Ping River….We will transfer you back to the hotel at 2200 or you can return to the hotel on your own. Check out at noon. Transfer to the airport. It is the end of your Chiang Rai Chiang Mai Loy Krathong Tour.